The Gallagher Chiefs finish on top in nail biting 30-27 win over the Jaguares in Buenos Aires. 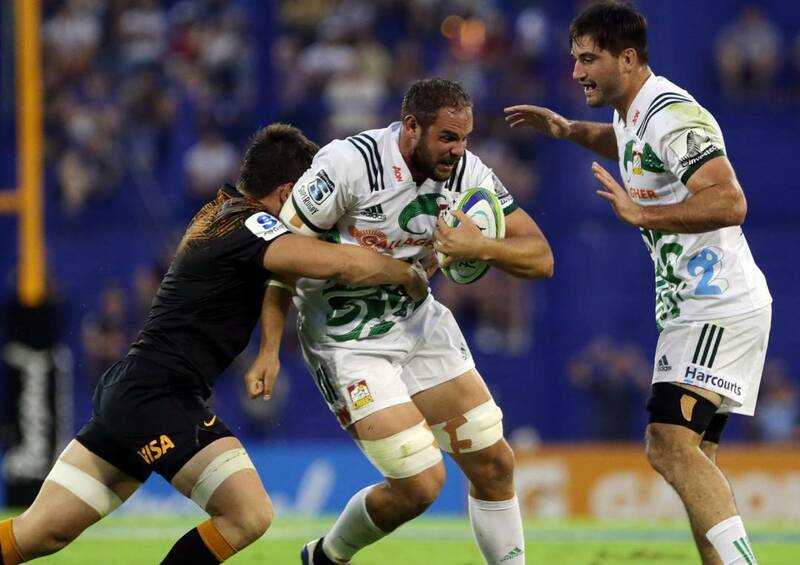 The Jaguares opened the scoring with a sixth-minute penalty to Joaquin Diaz Bonilla, which was quickly cancelled out by Damian McKenzie, before Diaz Bonilla nailed a second to see the Jaguares back in the lead. Midway through the half the Jaguares were penalised, providing Damian McKenzie the opportunity to level the scores. However the Gallagher Chiefs kicked to the corner hunting for the first try of the match. Off the back of the scrum Gallagher Chiefs number eight Tyler Ardron plunged at the line but was short. Quick recycling of the ball, saw Damian McKenzie stroll over the line untouched. Converting his own try from out wide it gave the Gallagher Chiefs a 10-6 advantage. The Gallagher Chiefs started to find their rhythm but were disrupted by an ill disciplined Jaguares side. In the 34th minute Tumua Manu crossed the line for the Gallagher Chiefs. Opting again for the corner, the Gallagher Chiefs set a rolling maul before Marty McKenzie chipped a clever kick through, hitting the goal post pads Tumua Manu scooped up and dove over between the sticks. Again Damian McKenzie faultless with his boot converted to extend the lead to 17-6. The Jaguares discipline continued to unravel, openside flanker Marcos Kremer received a yellow card in the 37th minute after his team were warned minutes prior by referee Angus Gardner. Despite having fourteen men on the park the Jaguares pushed for a try as halftime was nearing. However were denied after the Gallagher Chiefs defence held, holding hooked Julian Montoya up over the line. Unable to control the ball as the siren sounded for the break the teams ran into the sheds with the Gallagher Chiefs leading 17-6. Returning to the field the Gallagher Chiefs extended their lead through a Damian McKenzie penalty moments from kicking off the second half. The Jaguares in the need of points declined the opportunity of an easy three instead opting to attack from the corner. From the line out Diaz Bonilla sent an expert cross kick into the far corner, and full back Joaquin Tuculet collected it, grounding is before sliding over the deadball line. Bonilla converted to bring the hosts within seven, then 10 minutes later the Jaguares tied it up 20 all. Relieving the pressure, Damian McKenzie secured another penalty goal to edge the Gallagher Chiefs out in front with ten minutes remaining. But the lead was short lived with the Jaguares again playing under penalty advantage utilising their cross kick this time Matias Orlando snapping up the loose ball to score. Down by four with five minute remaining, the Gallagher Chiefs turned down a penalty shot and kicked for the lineout. Sending the ball wide Marty McKenzie’s pass was intercepted by Emiliano Boffelli, however Lienert Brown charged down the Jaguares clearing kick. The Gallagher Chiefs set a strong scrum, Taleni Seu peeled off the back and off loaded to replacement halfback Te Toiroa Tahuriorangi to score. Again Damian McKenzie converted the extras to see the Gallagher Chiefs into their bye week with a 30-27 win. The Gallagher Chiefs will return from their bye week to face the Blues at home on Saturday 13 April, kick off at 7.30pm at FMG Stadium Waikato.